When we don’t love our smile, we hide it. The implications are low self-esteem and confidence. In turn, this causes a negative impact on our personal and professional relationships. A veneer is a thin layer of porcelain or composite material that is customized and adhered to a tooth. They are one of the most popular and beautiful ways to improve your smile. Porcelain veneers (or laminate veneers) are ideal because the material most closely mimics the natural characteristics of enamel. Porcelain is translucent and able to refract light, which gives it a multi-dimensional appearance. 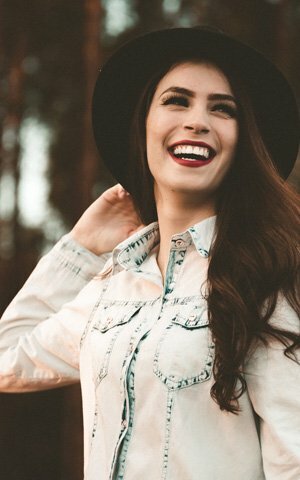 Dr. Anderson offers two types of veneers; the traditional and the No-Prep. Veneers are similar to crowns (also known as caps) in their purpose. But, unlike crowns, they merely create a new “front” for the tooth. If the tooth is damaged, chipped, misshapen, or crooked, a traditional veneer may be called for. In this case, a local anesthetic is used to numb the area being treated. A portion of tooth structure may need to be removed in order to facilitate the veneer’s proper fit, function, and appearance. The removal amount depends on how much misalignment exists. Impressions are taken and sent to the lab where customized porcelain veneers are created. Once the veneers are completed, the patient returns to the office for Dr. Anderson to assess the proper fit, bite, and appearance. Once all is satisfied, Dr. Anderson uses special bonding agents to adhere the veneer to the tooth. No-Prep veneers are made in the same way, however, they are suited to the patient requiring little to no adjustment in alignment of the front teeth. They’re great for correcting smaller issues such as discoloration or length. Without the need for drilling, the No-Prep veneer is great for those who desire an improved smile without injections. Call today to schedule a consultation with Dr. Anderson to find out if porcelain veneers are your best path to a winning smile.